Junior designers meet the brief, publishing calendar for Dinostar. Creative Briefs’ Junior Design Factory members present Dinostar with their calendar. 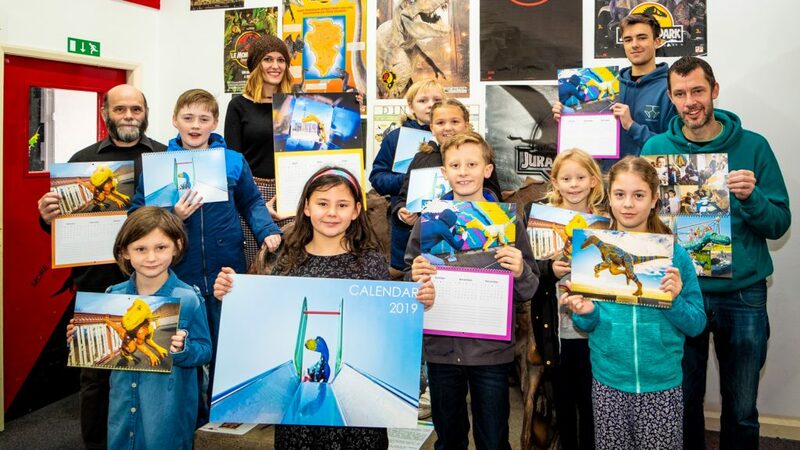 Children aged 8-15 years have completed a year-long project to create a calendar for Hull’s popular dinosaur museum, Dinostar on Humber Street. The project was delivered by Creative Briefs, a community-focused creative studio run by designers Jason Bowers and Rebecca Shipham. “Our Junior Design team were set a live brief by Hull museum Dinostar, to design, project manage, and promote a dinosaur themed calendar for 2019,” explains Rebecca. “The star of the calendar was to be Earl, a 4ft model dinosaur, donated to us by the client – Steve Plater, Director at Dinostar. Dinostar can be found at the east end of Humber Street, and has been a popular destination for children in the city for over a decade. The Dinostar museum has an exciting exhibition of dinosaurs and fossils. Highlights include a full-size T-rex skull, genuine Triceratops bones you can touch, and a unique ‘Dinosaur Sound Box’. Steve Plater, the dinosaur museum’s owner and director, says: “I was impressed by the work the team had done to blend the dinosaur with great Hull locations. The calendar is top quality and very professional, the children should be proud of their work. I hope the Junior Design Factory will be able to work with Dinostar again.” The calendar is available from Dinostar’s gift shop. The Junior Design Factory meets regularly on Saturday and Sunday mornings at Creative Briefs’ bespoke studio on Albert Avenue. Dinostar – The dinosaur experience. Be the first to comment on "Junior designers meet the brief, publishing calendar for Dinostar."